Akebono ProAct Ultra-Premium Ceramic Disc Brake Pads feature consistent performance for comfort and confident control of brakes. Akebono Pro-ACT Ultra-Premium ceramic brake pads utilize the aftermarket's only OE-validated, application-specific ceramic friction formulations. This guarantees that Pro-ACT Ultra-Premium ceramic brake pads provide the ultimate braking experience and restores each vehicle to brand new performance levels or better. With the Akebono Pro-ACT Ultra-Premium product line, all customers will receive OE-quality replacements because Akebono is the Original Equipment Manufacturer for most popular domestic and Japanese vehicles. Constructed with the finest quality materials, these premium ceramic brake pads provide a significant reduction in dust for cleaner wheels! The vehicle-optimized ceramic formulas ensure a best in class brake experience! Akebono has developed specific ceramic brake pad formulations for each vehicle model, assuring the best fit, performance, less wearing and the safest overall braking experience. 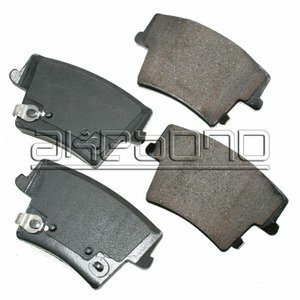 Akebono brake pads promise increased pad and rotor life and create the smoothest, most efficient stopping. No break-in needed with these high performance brake pads! The ultimate upgrade for OE semi-metallic & low metallic brake pads, the Akebono ProAct Ultra-Premium Ceramic Disc Brake Pad line is the best bang for your buck! Pairs perfectly with a wide assortment of brake rotors, calipers & brake drums. The Pep Boys Say : "Akebono invented ceramic brakes and have brought that expertise to this product. These are the pads we recommend if you want the best" - Guaranteed."